How to Play iTunes DRM Video on Kindle Fire? Q: How can I add a logo to a video? Hi, guys. I have some original videos and I’d like to share them online for publicity. My friends suggested me that I should mark my logo on it, so everyone who watched the video will know me. It’s awesome. Emm, the question is that I don’t know how to add a logo to a video. Anyone knows the way? I will be very appreciated for your kind help. Definitely, we often add a logo or watermark to some documents, pictures, photos and videos, etc. to prevent them from being copied or stolen so as to protect the copyright or sometimes more for anti-fake, advertisement and publicity. For documents or pictures, as it is known to us all, it is quite simple to add a logo or watermark. But not everyone knows how to add logo in video. As a matter of fact, it is not so difficult as you think at all. Several helpful solutions would be recommended here for you to take advantage of. 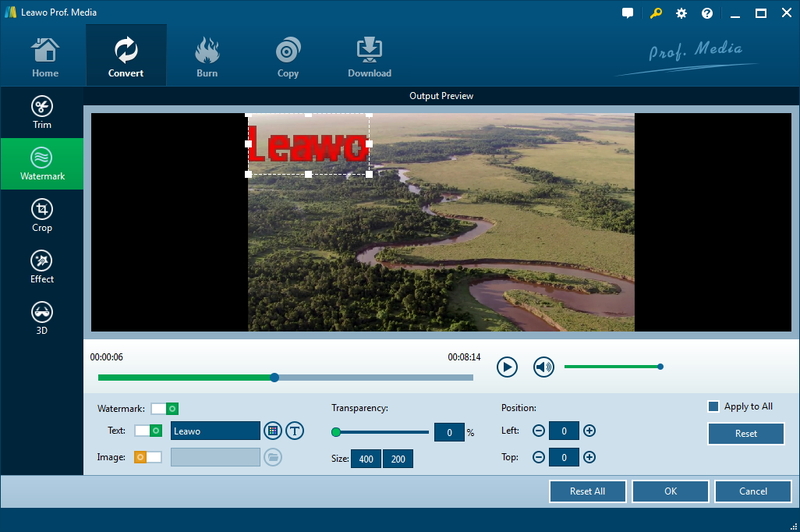 Download Leawo video converter and install it on your PC. Then, you start Prof. Media on your PC to enter the main interface, click on “Convert” on the top menu bar or “Video Converter”. Click on “Add files” to browse and choose the video you prefer to add a watermark for importing. 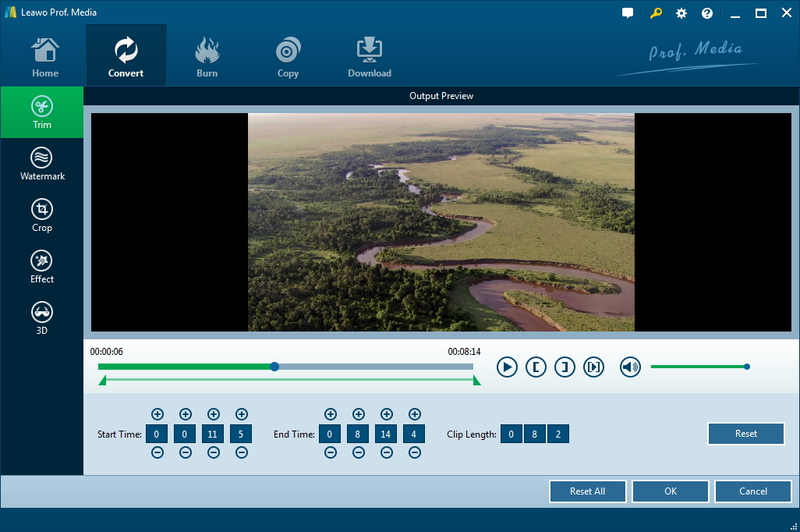 Or you can directly drag and drop the video into this converter. Note: You can click the rightmost blue “Merge all files into one” button to make several videos into one if necessary. On the processing panel where the imported video is listed, click the “Edit” icon at the right of video title to get into a real-time video previewing window, then you can edit and customize the video as you like. On the right bar of the previewing window, you can click on “Trim” to enter the section where you can set the video length as you need by directly dragging the side bar or setting the “Start time” and “End time”. Moreover, you can crop video clips and adjust video effect including “Brightness”, “Contrast”, and “Saturation” etc. to alter the video to make them ready to be uploaded to the Internet for your different needs. Anyway, now you finally add watermark to video and you can watch the video with your own personality. This would be the most convenient and secure way to add logo to MP4 video. Surely, there are also useful apps for android and iOS devices to add watermark to video. For Android devices, there are so many featured apps developed to add watermark to video so that you can directly edit your short video clips on your phone or tablet PC. Aiming to diversify the solutions on how to add a logo to a video, two frequently-used apps on Android will be referred here. Step 1: Load a video from gallery for watermark. Step 2: Add a Logo and click “Text” to write the words for your favorite settings. Step 3: Choose Slow/Fast mode of converting. Step 4: After the conversion, you can preview the watermarked video to see whether you are satisfied with it. And then you can save and share it in Facebook, Instagram and so on. Step 1: Tap “My Videos” to select the video you need to add watermark from gallery. Step 2: On “Preview” page, select a beloved image/logo from gallery to watermark the video. Step 3: Write your featured text with fonts, style, size and position on video. Step 4: Play the watermarked video and then save it or share the watermarked video to the popular video sharing sites like Facebook, YouTube, Instagram and so on. The two apps mentioned above are particularly for Android to add a watermark to a video. If you are using iOS devices such as iPhone or iPad, you should use the special apps designed for iOS system. 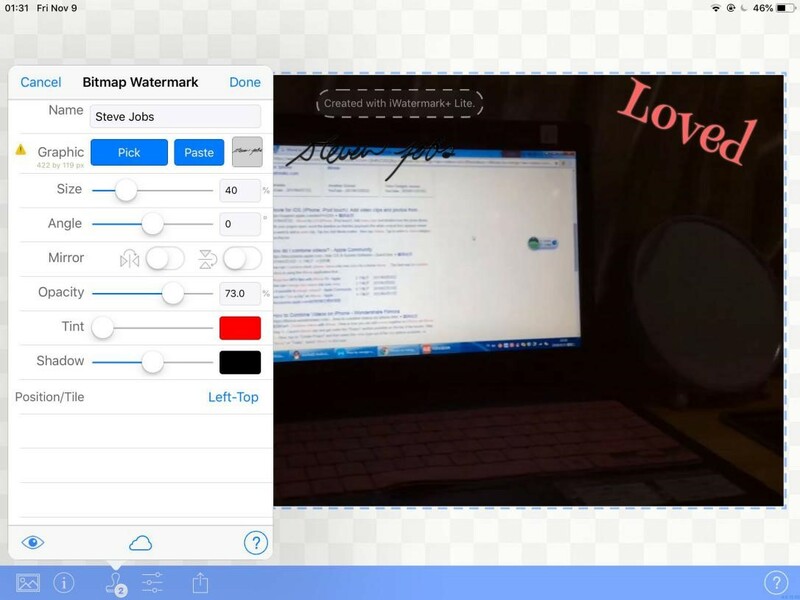 For iOS devices, there are also a lot of watermark apps developed for adding a logo or watermark for video. And the most commonly used apps are iWatermark+ and eZy Watermark lite-Video. Step 1: Choose video to the app by pressing the picture icon in the left corner. Step 2: Press the signet icon to choose a proper stamp for you or tap “Create New Watermark” to create your own. You can write the text for the video watermark by setting the font, color, size, position, etc. Step 3: Tap the cloud icon to store and share your watermarks online. 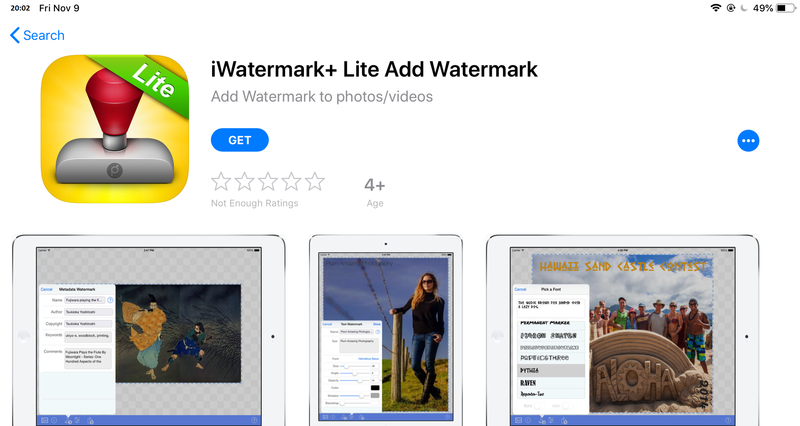 There will be “Create with iWatermark+” on the video, if you would like to eliminate it, you should upgrade it to full version which needs you to pay for it. 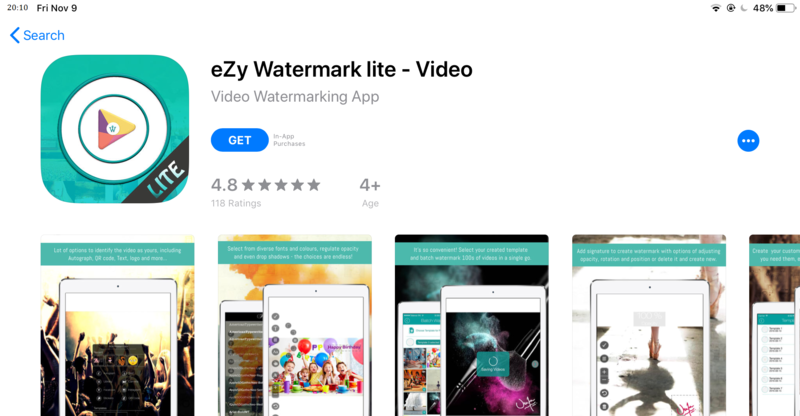 EZy watermark is also a frequently-used app for iOS devices users. It allows users to add a single video as well as a bunch of multiple videos from your camera or Instagram and Facebook to add watermark. Let’s follow the steps to know how to add watermark to a video with this video watermarking tool. Step 1: Tap “Single Video” to choose a video from “Library”, and tap “Use” to add it. Step 2: “Add Watermark” panel will pop up. You can choose “Text”, image from your Library and Stickers, etc. to be the watermark. When you write text on the video, you can choose the font, color, opacity, size and manually move the text and adjust the angle of the text. Step 3: Click “√” icon to save the watermark and preview the video. Step 4: Click “√” icon to save and share the watermarked video to Facebook, Instagram and Email, etc. There will be “eZy Watermark” on the video, if you would like to eliminate it, you should upgrade it to full version which requires some payment. 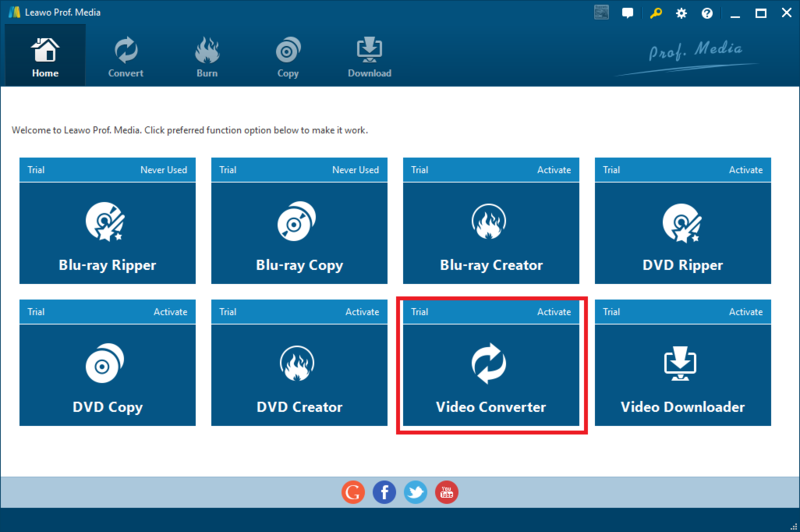 To sum up, if you are intended to add logo to MP4 video or add watermark to personalize or copyright your video, you’d better use Leawo video converter to fulfill it in simple steps. Besides, there are also apps for android and iOS, somewhat useful. You can choose the best way that works for you in different occasion. All the guide on how to add watermark to a video mentioned here will definitely help you a lot.